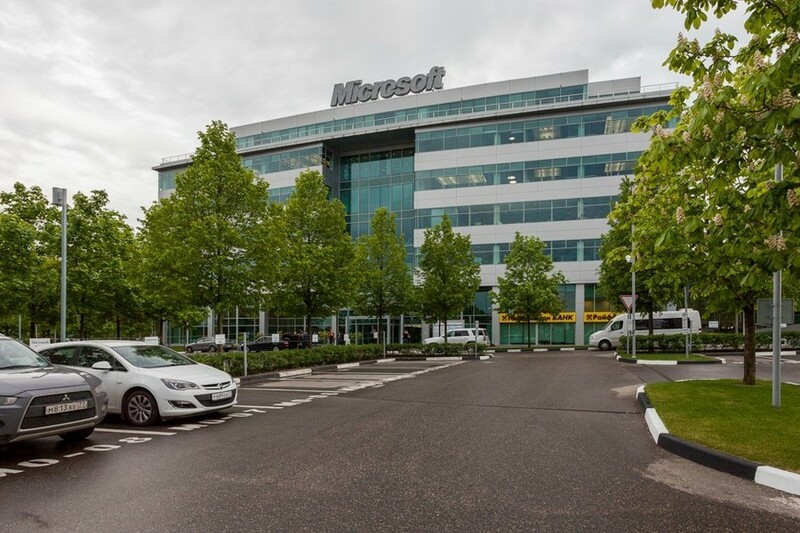 Over the past five years the Microsoft Company have changed their logo, mission and strategy. 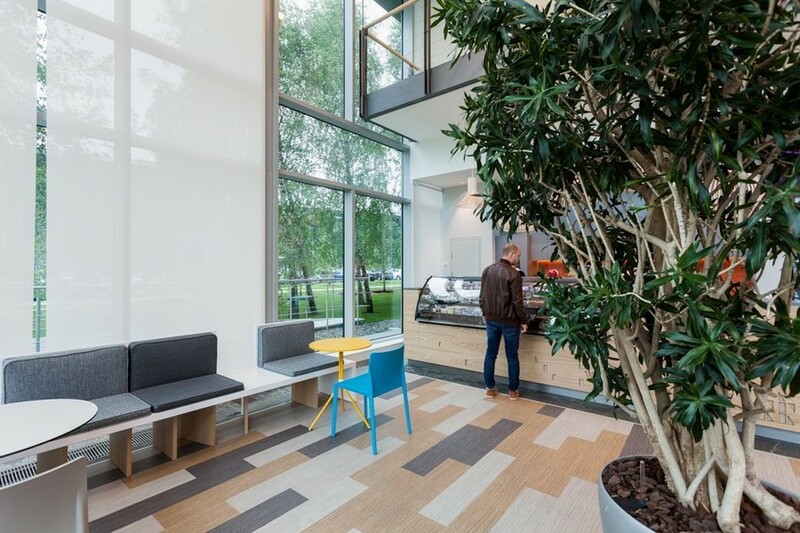 Now it’s time for their international office interiors. 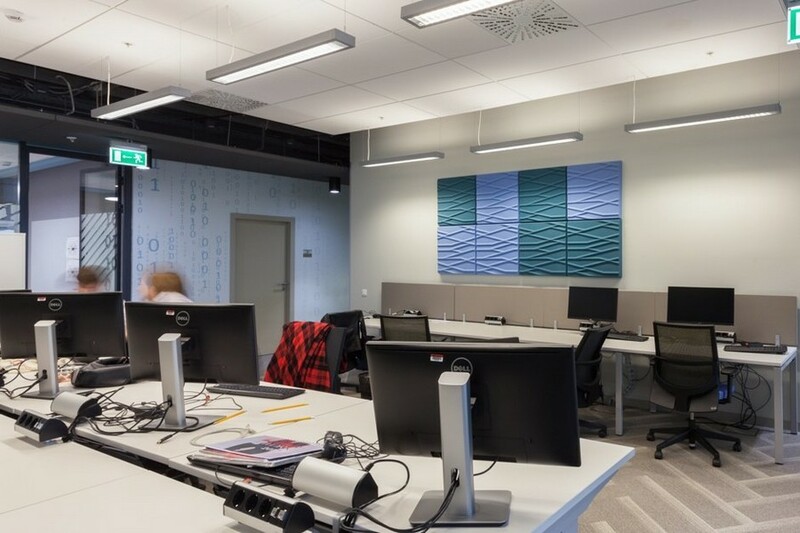 Following the renovation of headquarters in Germany, the Czech Republic and other countries the Russian office also went through refurbishment. 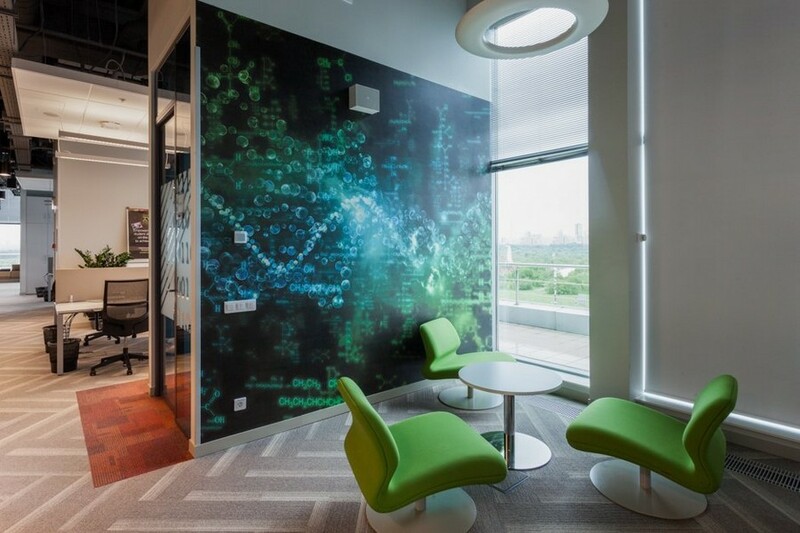 It took 6 months to complete and was officially finished yesterday, and we’re excited to have a sneak peek at how Microsoft employees in Moscow are working right now! 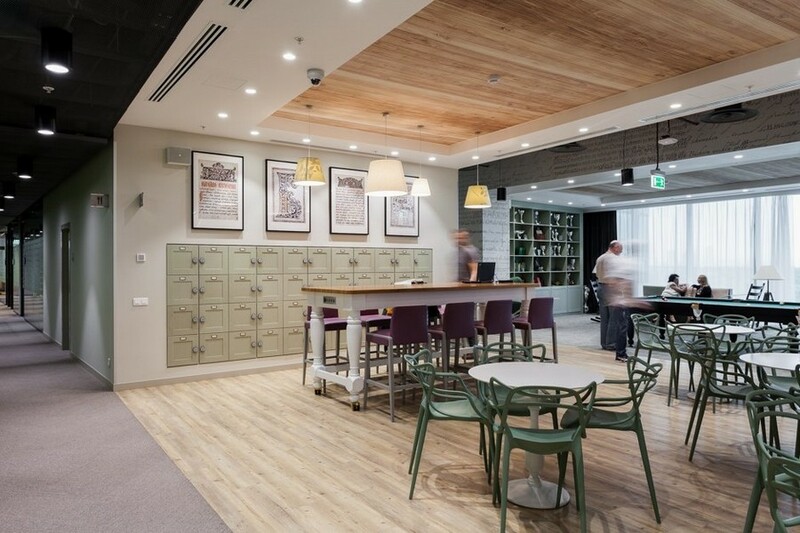 Microsoft’s policy requires its international offices to reflect their national identity in office interiors. 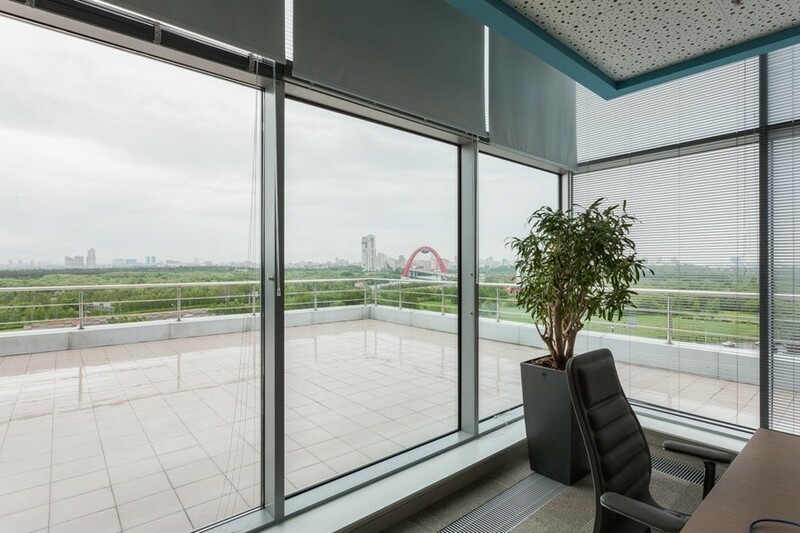 That is why each floor of the Moscow headquarters is dedicated to Russian music, arts, literature, theatre, space or science. The selected themes are backed by respective pieces of art: paintings by Pavel Filonov and Wassily Kandinsky, sketches of theatrical suits by Bakst, quotes from world famous literary works and etc. 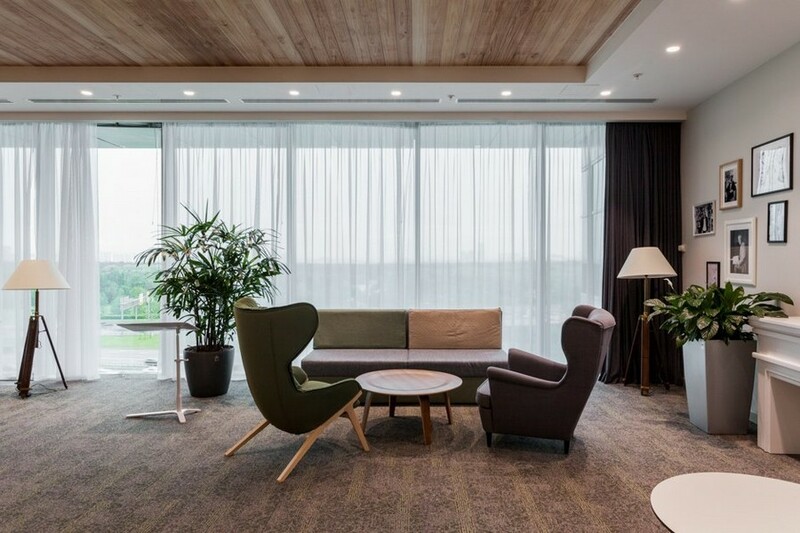 Open spaces are composed of two main types of work places: formal – in the “desk + chair” format and more informal and relaxed, furnished with sofas, ottomans and coffee tables. 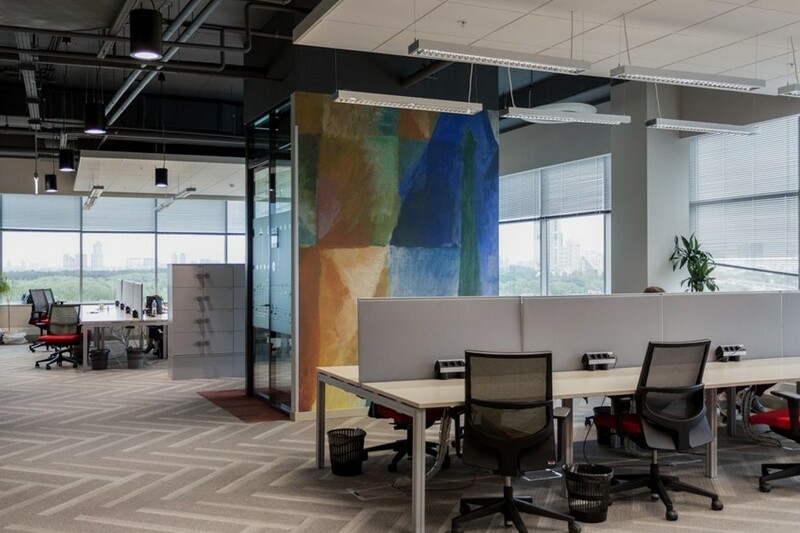 At the same time formal work stations are fewer by almost a quarter than the total number of employees, while the amount of comfy seats for work is 1.5 times more. The entire office furniture is adjustable and can be adapted for any person. 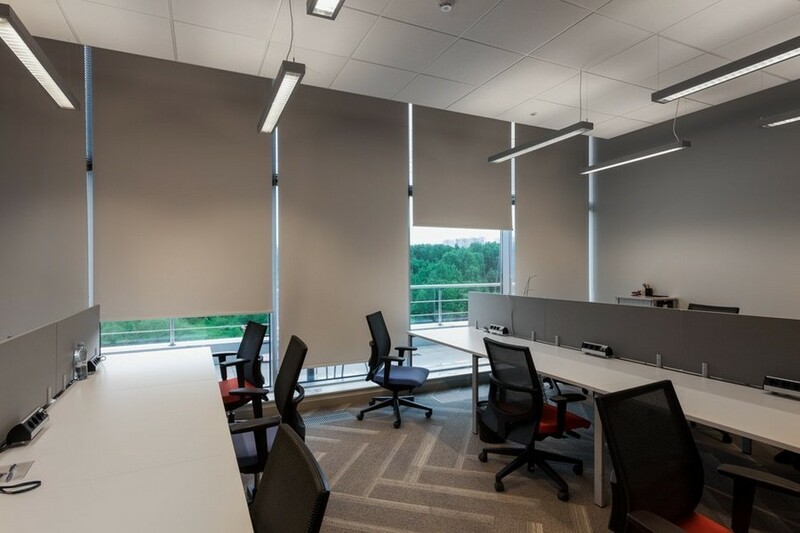 Those who enjoy working in scantily lit spaces may occupy so-called “dark zones” located far from the windows. The company widely practices the system of free seat selection, i.e. an employee can take any place he or she wants every morning. Such a decision was made to improve communication between the staff of different apartments. And finding your colleague on one of the 4 giant floors is not a problem thanks to computer technologies: the employees use their corporate social network dubbed “Yammer”, the “Teams” internal platform or “Skype for Business” messenger. The only department that always stays in the same place is IT Link, an internal support service; so, everyone knows where to find a specialist when a computer program or a device itself would fail. 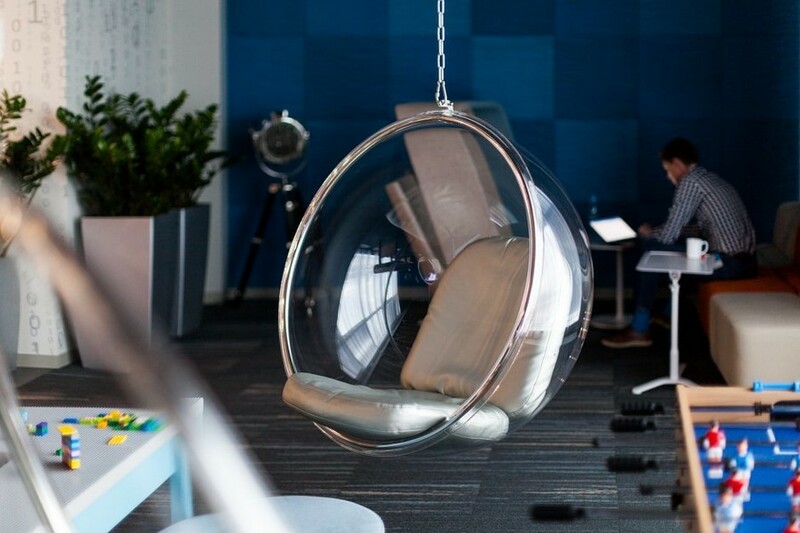 Newcomers say it takes about one month to start navigating the huge office comfortably. By the way, the total area of it amounts to about 6,200 square meters. Navigation is improved by the above-mentioned thematic designs of each floor and the respective color zoning of each space: deep blue for the “space” storey and soft green for the “literature” floor, for example. 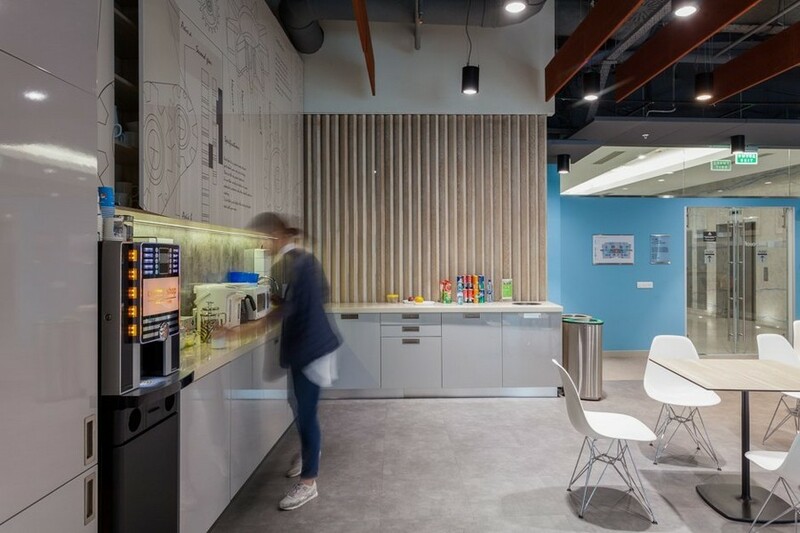 In Microsoft no one pays attention to the time one enters and leaves the office. It’s possible to work from home or at night. When international teams work on the same project, meetings with foreign colleagues can be held at 5 a.m. due to time zone differences. 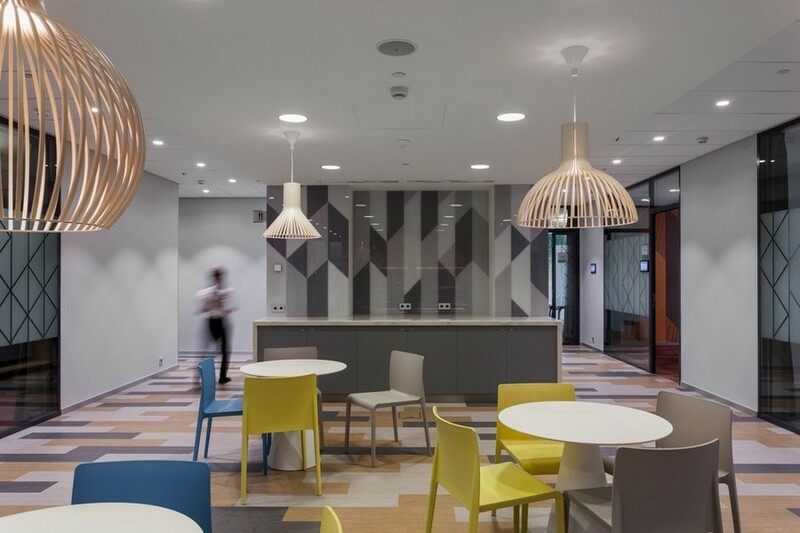 The office features plenty of meeting rooms, each differently sized and shaped. There are so-called “phone booths” for one person, where an employee may have privacy for a phone call or some task requiring much concentration. 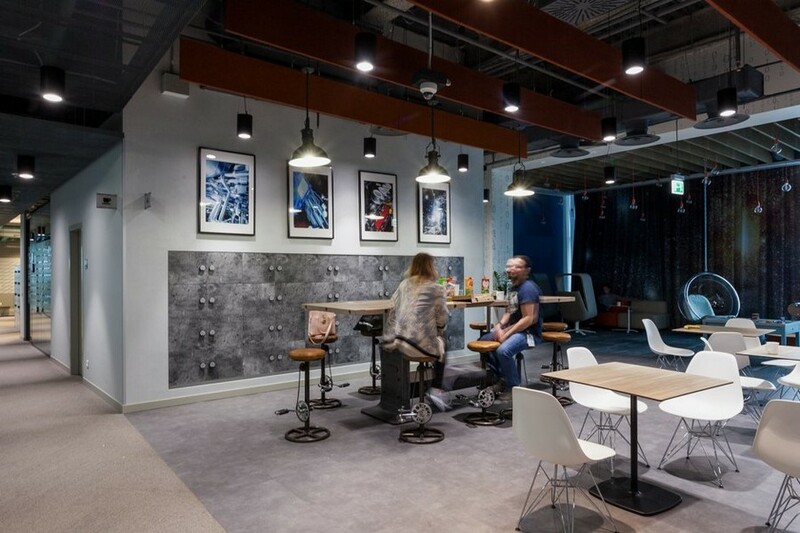 Any room can be booked within a system built on Microsoft cloud technologies. 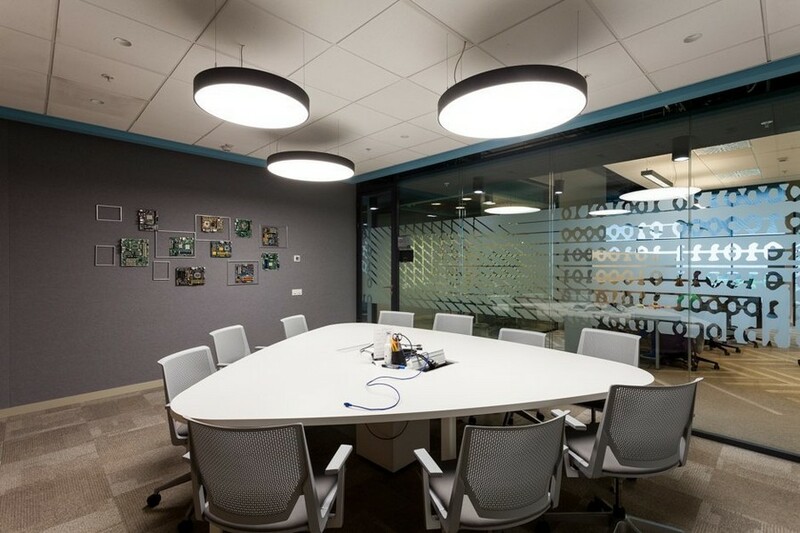 Besides, every meeting room has embedded temperature, motion and lighting control sensors, and if within 15 minutes from the appointed time of meeting no one occupies the room, the sensors detect it and cancel the meeting in the system automatically. The main interior accents are hubs – spaces with kitchens, lounges and game zones. 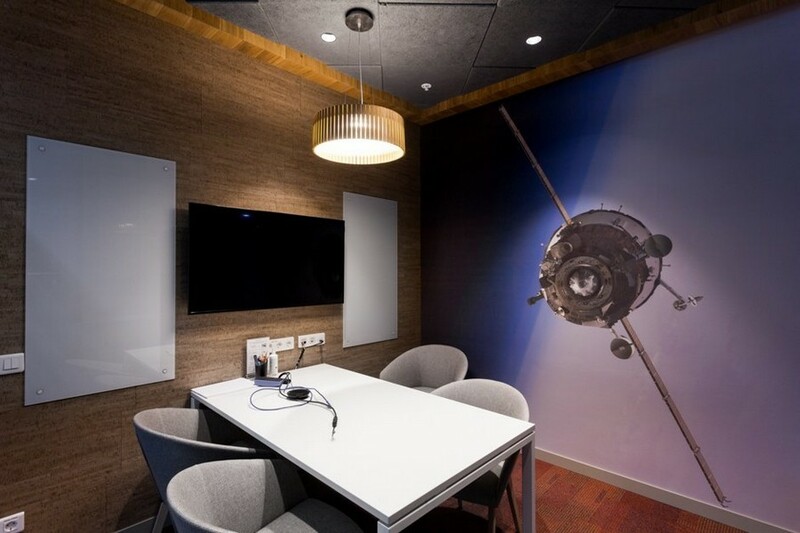 On a “literature and theatre” floor the hub is designed in style of a living room with a home library and portraits of prominent Russian poets and writers, while in the “musical” hub walls are decorated with real music instruments and vinyls. Every kitchen is equipped with refrigerators, microwave ovens and coffee machines. They are always packed with water, juice, fruits and ice-cream. Here the teams celebrate their holidays, achievements and victories or just come to share pizzas. 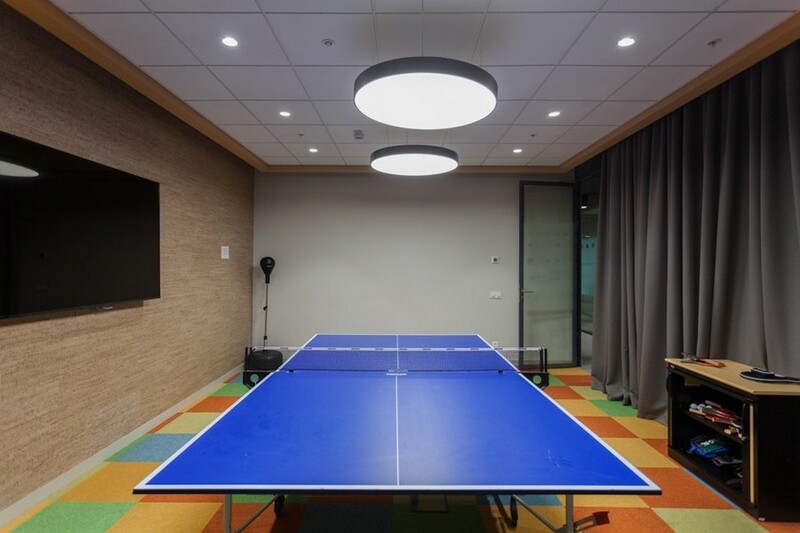 Besides the hubs, the recreational area of the office includes showers and a gym with a ping-pong table, a punching bag, workout equipment and a massage chair. Also there’s a doctor’s office, which is open twice a week. 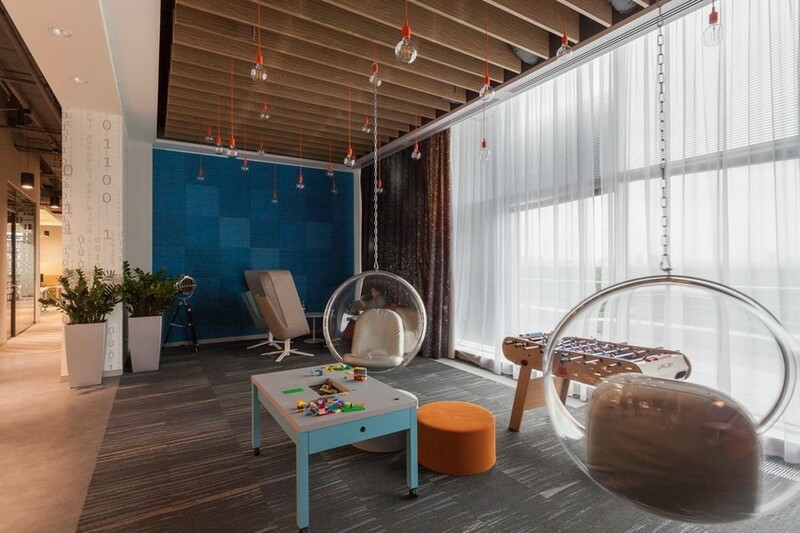 Microsoft employees are allowed to bring kids to work and for this purpose there’s a day-care facility and a LEGO table in one of the hubs. 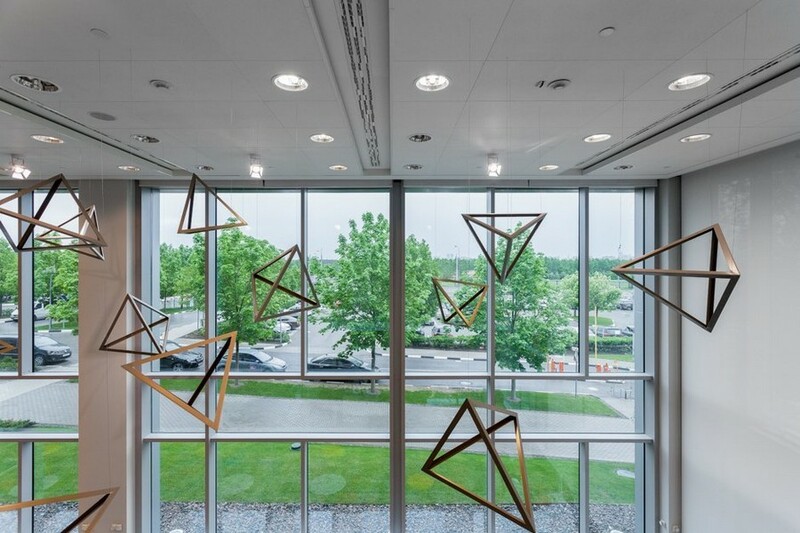 Conference halls with high ceilings on the first floor do not stay idle when no formal meetings are planned – Microsoft tinkerers come here to do yoga and pilates. Besides, any vacant meeting room can be booked for free team English, Spanish and French language courses.